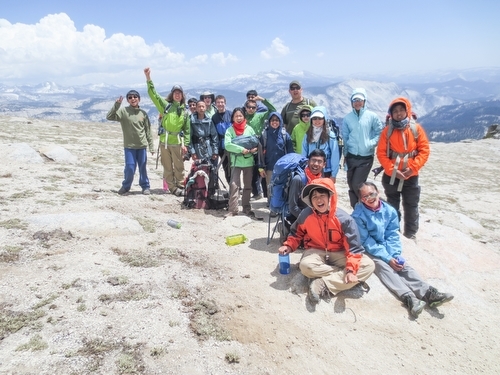 In mid-June, 19 students and three teachers set off on a five-day backpacking adventure in Yosemite National Park. The annual summer Middle School Backpacking Trip required students to carry their own supplies, as well as make their own food, teaching them independence and resilience. With California as their classroom, science teachers Ben Morgensen and Daniel Sommer, and math teacher Margaret Huntley, accompanied students on the trip, which began with setting up an overnight camp at the Crane Flat Campground. “The backpacking trip was incredible! We hiked to and camped at the truly amazing May Lake, with a pristine lake, snow-capped peaks and view out across Yosemite. We did a day hike to Mt. Hoffmann (10,856 ft.) then hiked to Murphy Creek and camped there for a night before hiking out and driving home. We had beautiful weather and a great mix of first-time and returning hikers, some sleeping in a tent for the first time and others taking on real leadership roles,” recalled Huntley. After leaving the Crane Flat Campground, the group drove along Tioga Road to the May Lake Trailhead. “On the way, as we steadily rose from the lush conifers of Crane Flat to the barren alpine landscape of Yosemite’s High Country, we watched the land unfold in front of us, with towering peaks jutting sharply into the deep blue sky and babbling brooks merrily cascading down deep gorges,” reminisced rising grade 9 student Andy Semenza. Once the group arrived at the trailhead, it was a short hike up to May Lake through the alpine landscape, made more difficult by the heavy loads they carried. Upon their arrival at the lake beneath Mt. Hoffmann, they proceeded to set up camp and cook dinner. The next morning, the students made their incredible climb up Mt. Hoffmann. Then, after a grueling descent into Murphy Creek, many of them successfully fished for trout in the lake. That night, some of the group opted to forgo the shelter of a tent and spent the night in sleeping bags on the granite. “Throughout that week, we learned many lessons only possible outside the confines of the classroom walls – from the crippling effects of altitude to the feeding practices of ospreys. However, we also had to cope with more psychological issues, like managing a good pace for a group or dealing with tent mates,” surmised Semenza.